FBI is arguably the best dance crew in Kenya at the moment. They have won countless awards and have competed across the world and emerged the best in several occasions. Their talent is epic and they are passionate with what they do. This made Dr. Evans Kidero, Nairobi’s governor to boost their finances with a whooping 0.9 million Kenyan shillings. The kings of dance in Africa could not hide their joy and they went ahead to share their amazing news in their social media pages. 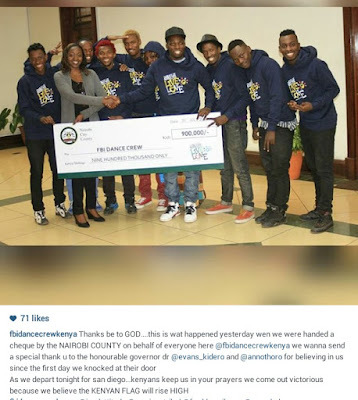 They truly thanked the Nairobi county government for uplifting and rewarding their efforts.